A well earned rest and cuppa for Miles and Luke who have spent many many hours over the last couple of years building our new 5 bay barn. This has replaced our range of 1940’s buildings which were really on their “last legs” and not fit for purpose anymore. 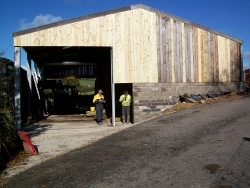 At last the barn is weather proof with roof, block wall bases and boarding or Yorkshire boarding for the walls. We had to have help laying the 30 cubic meters of ready mixed concrete and for the electrical fixtures but this like all our projects is truly home built with the families hard graft. It will be a joy to use this winter and many more to come!